Create and Print Your Own Funny Awards in Just Minutes! 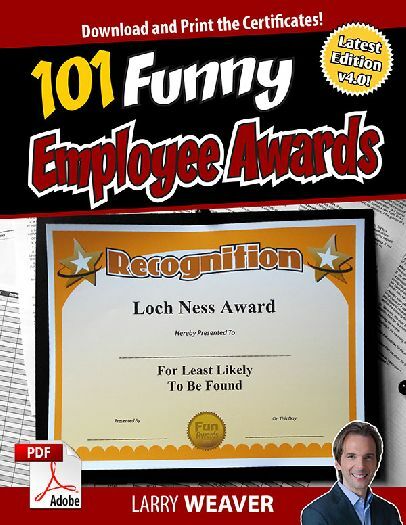 PDF download includes 101 Hilarious Printable Certificates + 6 Blank Templates for making up your own Funny Awards! Purchase now and start using right away! Everything you need to know to organize an entertaining and rewarding ceremony is here. And most important, you’ll get 101 awards certificates that will be appropriate for everyone around the office, no matter the employee or the type of business. Includes 101 printable award certificates with various designs packaged in a downloadable PDF file that works on a PC or Mac. As a bonus, you'll get 6 blank award templates for creating your own custom funny awards. You can add what you need — by typing directly into the PDF, by using your word processing application, e.g. Microsoft Word, or by handwriting — to make the certificate or handout work for you. Print as many as you like on the paper of your choice. Designs are set to work on standard 8.5” x 11” paper. It’s simple and easy to do. Please see the preview for a look at the different award certificates.